As soon as I entered the plane I knew this was going to me awesome. An FA immediately took my jacket and carry on and placed them in the cupboard for me. "Mr Jermyn, can I get you a drink before we depart"? "Yes please, I'd love a glass of champagne. Which champagne are you serving today"? (eyes and smile immediately lighting up)"Winston Churchill?" "Yes Mr Jermyn. Do you know it"? "It is one of my favourites"
"I'll make sure it is a large glass then"! NB. This started off as a large glass but was half full (easy to be an optimist when you have the nose of a 747 to yourself) by the time I got round to taking a picture. I was particularly impressed by the glassware. I think that the combination of full sized flute with a much reduced stem, works really well in the air. I'd much rather this than an infantilised mini flute, which retains its proportions only to massively diminish the vessel's capacity to deliver my booze. After having some sips of the champagne I quickly went to town, taking pictures of the empty cabin. Also, the slippers are nicer. They have thick padding on the heel, where the J ones are just thin disposable ones. The colour, on the other hand, is a matter of opinion. Soon enough the FA asked if I needed a refill (I did) and handed over the menus for today's short flight. I decided to go for the Western starter followed by the Bibimbap. The FA asked if I would like soup too and I figured 'why not? ', if a man can polish off a bottle of champagne for breakfast he can sure as hell manage a soup. The overall look of Asiana's food offering in F, is outstanding. Full sized cutlery, a bread dish suited to the limited space on the table, individual salt and pepper pots, olive oil and balsamic vinegar bottled and ready to pour into a dipping bowl, elegantly shaped plates and bowls and a long stem rose. This is how you present a First class meal. The more eagle eyed of you will have noticed that there are two champagne flutes in the second Bibimbap picture. This is because having noticed that bottle of Pol was nearly empty, I thought it was high time to try another 2000 vintage champagne. The Heidseick Millesime. The FA quickly obliged and presented the bottle to me so that I had a picture of the label, should I decide I wanted to buy some on the ground. 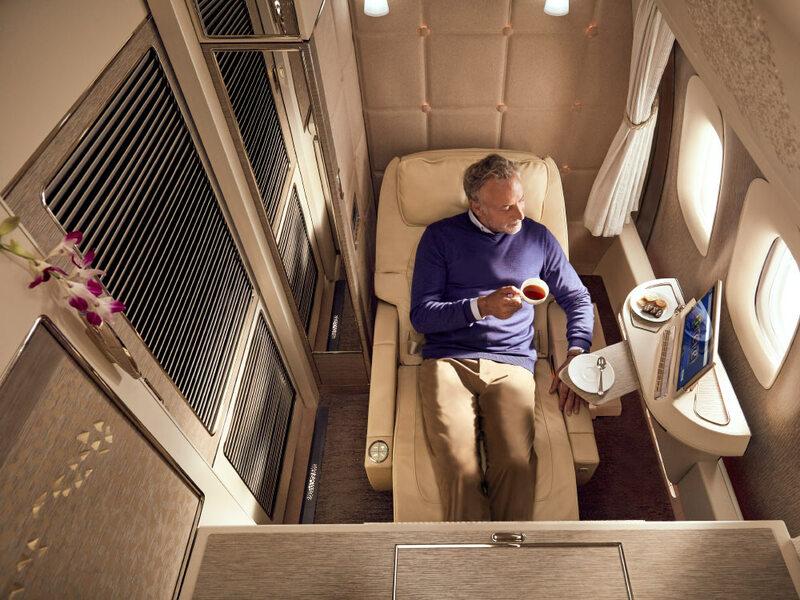 It transpires that the Millesime was not enormously to my liking but I love the fact that OZ catered both champagne options for a single pax in the F cabin. Once again, when it comes to service and more specifically meeting the expectations of F passengers, OZ just hits the nail on the head. There is no room for disappointment, you know what the hard product is like (and by the looks of things it is world beating in the suites) but there is just no way in which you can get a negative impression of OZ from a soft product perspective. Between the F and J flights I did not see a single flaw. The OZ crew is truly remarkable. After the meal I went to the bathroom (no massively eager hand towel service this time) and returned to see that all the shades had been pulled down for me, with the exception of the three next to my seat. This made for some great lighting conditions for further cabin shots. Soon enough we were touching down in NRT, with that exhilarating expression of kinetic energy taking place a couple of feet away from me, as the landing gear hammered down onto the tarmac.